Cost, price and value. These words are often used interchangeably. We tend to assume that, in most competitive markets, the price for purchasing something is roughly aligned with the cost of producing it (plus a modest profit!). And because we assume that companies are good at matching supply with demand or finding that perfect balance between what people are willing to sell something for and what others are willing to pay for it, there’s a tendency to equate market price with intrinsic value. All of these assumptions are fundamental to the way most economists see the world. They are the foundation for measuring output and productivity. But how would all that change if these variables weren’t so tightly aligned? Over many years economists have come to understand and acknowledge that markets are a lot less than perfectly competitive, with much of this work being explored under the banner of behavioural economics. This has been the subject of many best-selling books in recent years, including Priceless, where William Poundstone offers an easily readable tour of this research. There are many pricing principles that are supported by different experiments. These include the law of diminishing returns to money – that to most human beings, the pleasure of finding a $50 note lying on the street was not, in fact, five times the pleasure of finding a $10 note. From there are specific concepts, such as priming, bundling and anchoring; specific applications such as 99p, "free", sizing and finally specific analysis of influencing factors such as intelligence and context. What matters most, it turns out, is not the absolute price but the relative price. While the research is predominately consumer based there are lessons for all of us in a professional capacity. Why are some businesses fixated on justifying their costs rather than considering the value they can add to a client’s business. This is what clients are investing in after all, isn’t it? Wouldn’t it be refreshing if we started to focus on the outputs and the value a project can add to a business opposed to inputs of the project and their associated costs? For years, procurement professionals of a business are invariably tasked with driving the costs down, but marketers are tasked with driving up the firm’s value! In this book however, we now have proof to support the quote from Oscar Wilde, where he observed "people know the price of everything, but the value of nothing". 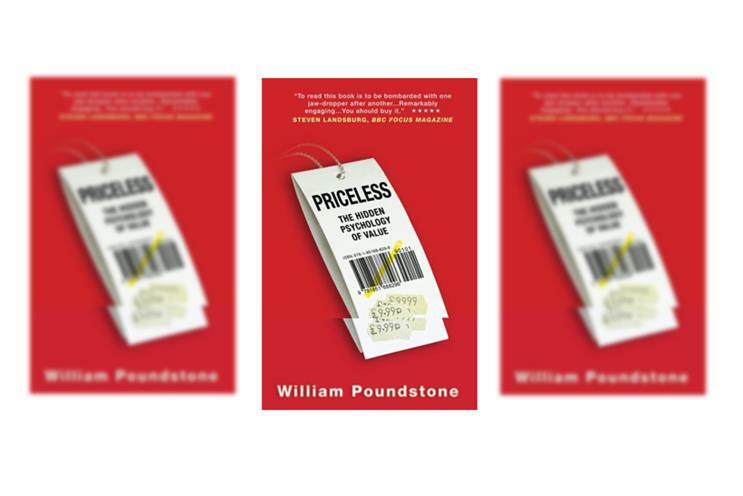 William Poundstone explores the hidden psychology of value and explores how we react to the most persuasive of all – price. The book is a collection of behavioural experiments and real life examples, which build and focus as you move through the book, and explain why prices are so important, yet with all the illusion surrounding them. The book is easily readable. Indeed, it is broken down into 55 short chapters, so you can read it in bite-sized chunks. It begins with our cluelessness about prices, gives us some psychological grounding, shows us good and bad pricing in action, and gives us greater awareness of our limitations and how to improve on them. It challenges your very thinking about pricing and the strategies and models you may wish to use and is a good read for anyone who buys, sells or negotiates. It's written in an entertaining anecdotal style that doesn't require any previous behaviour economics knowledge. Anyone interested in understanding how humans can be influenced to find certain prices more attractive will benefit from reading this book. Also, once you've read this book you'll never look at a restaurant menu in the same way again!